If the Ghostbusters each make up a respective part of the body that makes up the organization, Bill Murray’s Peter Venkman is undoubtedly the mouth. Fitting for a Bill Murray character, right? I suppose you could be more generous, and more generally make him the face, since that’s what he is for a lot of people; the face of the Ghostbusters. 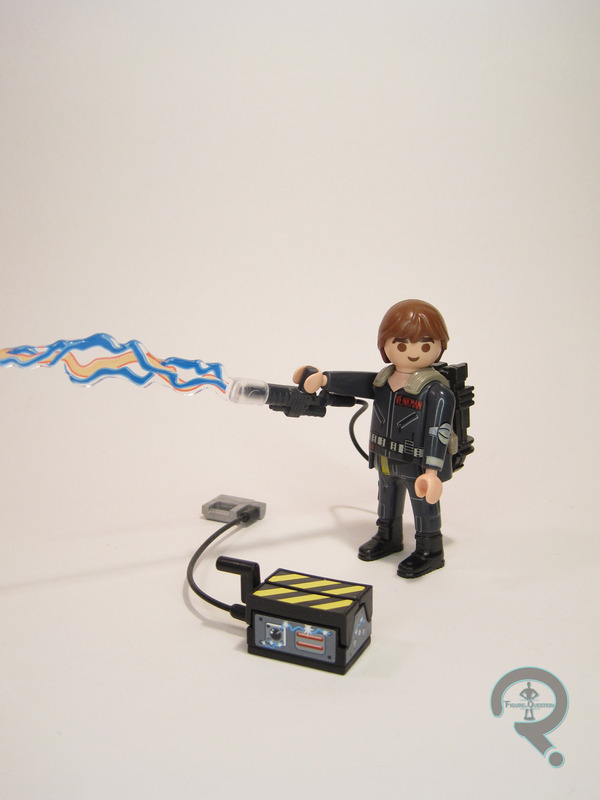 Venkman is part of the same Playmogram 3D sub-line of Ghostbusters Playmobil figures as yesterday’s Egon. He too is sporting his darker Ghostbusters 2 togs, which are rather unique, I suppose. The figure stands 3 inches tall and has 6 points of articulation. 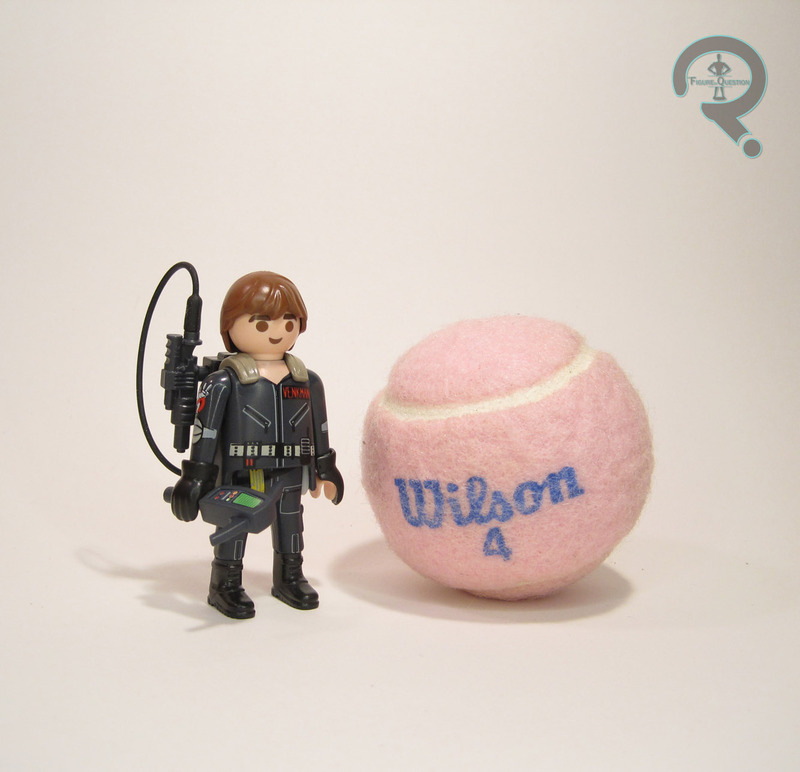 He’s built on the same body as Egon, but with one notable exception. His hair’s a new piece, and, like Egon’s, it seems a little off for Venkman. He lacks Murray’s pronounced hairline, and instead gets something a fair bit more generic. I actually think it’s a piece that’s been used before, but I’m not well-versed enough with Playmobil to know for sure. The point is, it definitely muddies up any sort of likeness. Maybe there’s a larger likeness rights issue going on here? I don’t know. It’s also possible they couldn’t make the proper hairstyle work with the construction of the head, thus neccesitating this differing look. Also, this is a very minor thing, but since he re-uses the exact same base body as Egon, that means he’s actually missing one Peter-specific detail: his pants legs are tucked into his boots. That’s a consistent feature of his, across just about every figure he’s gotten. Of course, it’s also easily overlooked, so it’s hard to say. Venkman’s paintwork is quite similar to Egon’s, but his uniform is unslimed (kind of amusing really, since the situation is usually flipped). Peter includes the same accesory compliment as Egon, minus the puddle of slime, so he’s got his proton pack, PKE meter, and ghost trap. The piece that interacts with the Playmofram 3D feature is also given a pink coloring instead of green. Woooo? I found Venkman at the same time as Egon. Since I was getting Egon, and they were both pretty cheap, home he came. He’s not quite as strong a figure as Egon, but he’s still decent enough, and I’m happy to have him in the set.